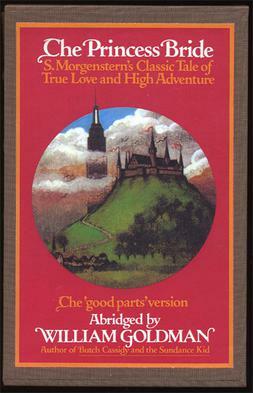 Book Review of “The Princess Bride: S. Morgenstern’s Classic Tale of True Love and High Adventure” by William Goldman. Many years ago, in the land of Florin, there lived a girl who had the potential of being the most beautiful woman in the world. Her name was Buttercup, and she was a milkmaid. Westley was her family’s farm boy. The truth is Buttercup didn’t know she was in love with Westley; and although Westley knew he loved Buttercup, he had nothing to offer her, and they departed for him to seek his fame and fortune. This is how the true account of their story begins, which quickly leads to many adventures (and misadventures) for both Westley and Buttercup, before they can finally be reunited. Along the way they encounter Prince Humperdink, who is determined to marry Buttercup and make her his queen, with the assistance of his most trusted Count Rugen. But the course of true love also includes such interesting people as Fezzic the giant, the Spaniard master swordsman Inigo Montoya and the Dread Pirate Roberts. Does that sound like a fairy-tale to you? Of course it does. But throughout this book, Goldman insists that all he has done is take an existing true story that was desperately overly wordy and technical in order to extract from it the “good parts”. This, because he wanted to make it as close as possible to the story his father read aloud to him when he was recovering from Pneumonia at the age of about ten years old. The original, he states, was written in Florinese (the national language of the country called Florin) by one S. Morgenstern. Apparently, Morgenstern’s original book has “been on the Florinese Times bestseller list continuously since the week it was published”! But it really doesn’t matter if you decide that this pretense is fact or fiction. One way or another, this is a book that will warm your heart and make you smile – if not laugh out loud, as I did. And so the stage is set for a myriad of adventures, heartbreak, romance, intrigue and everything a perfect fairy tale could offer. But this isn’t a fairy tale – or is it? Sound a bit muddled and convoluted to you? Well, you see, this was apparently Goldman’s problem with Morgenstern’s original text versus what his father read to him when sick as a child. Because of this, Goldman has attempted to remove all of the superfluous passages (including whole chapters, when necessary), while allowing himself to interject from time to time with his own insights and commentary. Some readers might find this a pretty egotistical way to abridge a story. However, I found that quite to the contrary, it was these interjections and comments that made the whole thing come alive for me. Sort of like being slapped in the face every so often by a velvet glove – here we are, deep in the convoluted story and then Goldman brings us almost rudely back to the present with something as obvious as “they had acres back then” or as silly as “they had arguments then too”. Goldman’s “abridgment” of this story not only helps us concentrate on the essence of the tale (by eliminating the “not good parts”), but also brings us closer to these characters (um… historical figures) by practically speaking to us through his commentary. The humor he puts into his commentary and interjections perfectly parallels, as well as compliments the humor of Morgenstern’s original text. If you don’t at least crack a smile while reading this book, then your funny bone must be made of hardened, cold, molten stone! In addition, Goldman also appeals to our senses of wonder, amazement, bravery and valor, while showing us that these do not exist in a vacuum, but are part and parcel of a world that holds evil as well. Still, he gives us hope that good can overcome evil if we only believe that it is possible. It is probably this message that Goldman is trying to put forth to us, and he does it by doing everything in his power to make you believe that this is no fairy tale, but a true story – a historic account and that these people really did exist and triumphed through adversity we can’t even fathom to understand. Lastly, Goldman always leaves you wondering and wanting more, because, after all isn’t life just one big question that’s never totally answered? Much like the famous Reunion Scene that Goldman wrote, was stopped from including in the original edition of the book, and is to this day, buried in litigation and mystery – yet hope still springs eternal! The Princess Bride is available for purchase (via these affiliate links) from Amazon, Barnes & Noble, Kobo, iTunes (iBook or AudioBook), eBooks, The Book Depository (free shipping worldwide), new or used from Better World Books (to support libraries and world literacy) and Alibris, or from an IndieBound bookstore near you. This is a revised version of my review, which was originally published under my username TheChocolateLady on the now defunct sites DooYoo, Ciao, and the Yahoo! Contributor Network (aka Associated Content). Previous Post Who am I to be writing book reviews? Next Post So… who is this "Chocolate Lady" of whom you speak?